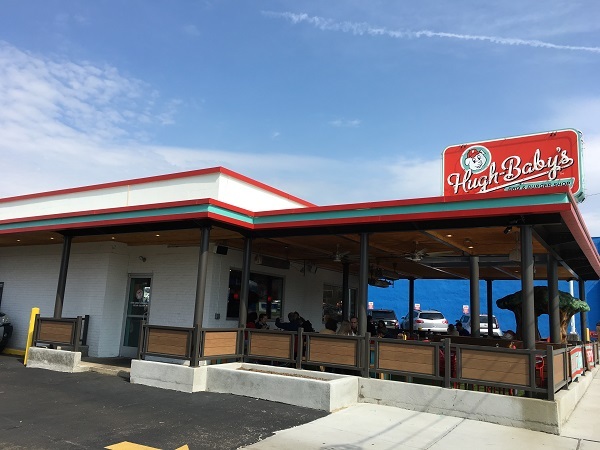 Hugh-Baby’s, Nashville TN – Marie, Let's Eat! It was a strange little road trip that had me planning to visit a popular restaurant only to switch and visit a different place with the same owner. Earlier this month, we went to Memphis for a long weekend. It wasn’t going to be like some of our previous trips to the city that gave me time to sample two or three new barbecue restaurants; this was a family-focused visit with almost every meal planned in advance. But getting there could still be half the fun! Even though we don’t currently have the ability to get out on long trips like we once did, I still plan for stops along the way, and we were really, really overdue for a visit to Martin’s Bar-B-Que Joint in Nolensville. And then plans changed in a fun way. Writing for Garden & Gun, John T. Edge penned a story about Hugh-Baby’s, which Pat Martin had recently opened in Nashville. This sounded like a must-try, particularly since Edge got a killer quote from Martin for the story: “Remember when Wendy’s was actually good?” I have said that myself I don’t know how many times. Martin’s idea with Hugh-Baby’s is to revisit the 1970s. It’s a different sort of nostalgia from most of the typical new Southern restaurants that get a lot of press and attention, the kind of places that look longingly at old screen porches and Sunday suppers. My family ate at Wendy’s more than any other fast food place in the late 1970s, and I swear it was exponentially better than that dry, crisp stuff that they serve these days. I talk about this frequently; not because I’m obsessed, but because my job brings me into conversation with lots of new clients, and their small talk often comes around to the fast food they enjoy. I used to enjoy Wendy’s. Then again, I never ordered loaded hot dogs or slugburgers at Wendy’s, either. We checked in with our friend Brooke and arrived in Nashville a few minutes before her. That gave us a few minutes to get a little exercise at the park across the street and also smile over the selection of photos on Hugh-Baby’s walls. If you enjoy the restaurants that we like to spotlight at our blog, you’ll love these: fourteen framed photos of famous small restaurants from Memphis to Florence, including one that we’d be revisiting in about 24 hours. “I’ve been to eight,” I said with thumbs up. And one of them, Corinth’s White Trolley Cafe, was where I had my first slugburger, and then I said that I need never sample another. But dadblast it, I just can’t quit ordering the things, even though I really would prefer one made with all beef most of the time. I’ve had slugs at five or six places, and only loved the one at C.F. Penn’s. Hugh-Baby’s is every bit as good. They only serve them on Fridays, which is why we stopped on our way to Memphis instead of on our way back, and the majority of the guests still don’t know what they are, leading a server to do the rounds with samples. It’s crispy but moist, and has a great flavor. I really enjoyed this. 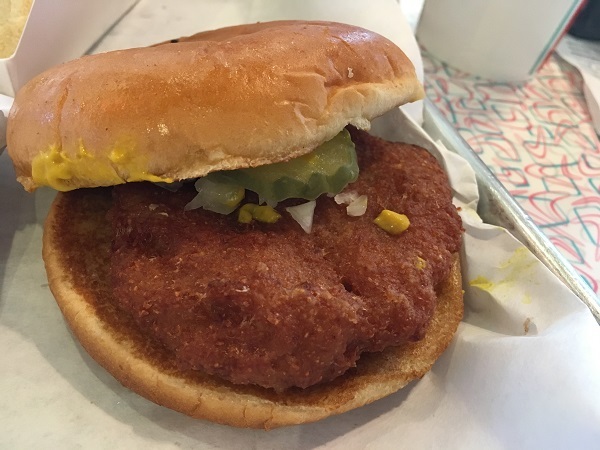 If I’d had this as my first slugburger, I’d have then bumbled around northern Alabama and Mississippi wondering why nobody else could make them as good as Hugh-Baby’s. Marie has no time or patience for my slugburger fascination. She ordered a regular burger without the special sauce, and said it was juicy, wonderful, and even better than Wendy’s was when it was actually good. 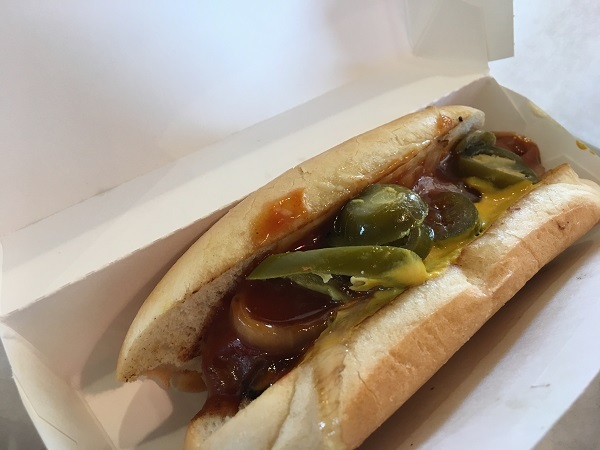 Our son continued his now-legendary picky eating crusade and just wanted a naked hot dog with ketchup, an order that caused the ticking machine of the service to stumble, weirdly. There are four dogs on the menu. Substituting or deleting toppings doesn’t seem to be programmed into the cash register options. Brooke, who we hadn’t seen in an age, was very happy with her barbecue sandwich, and was surprised that I didn’t order one. Plenty of that on the agenda, I told her, including a stop in Nolensville which we’ll share soon. Hugh-Baby’s was designed to expand. A second location is in the planning stages, just like six of Pat Martin’s Bar-B-Que Joints are dotted around the Nashville metro. I freaking hope they expand east. Chattanooga badly needs both! About the only down side to this location is that there’s not very much parking. However, there is a city park across the street with room for more cars. When we finished eating, since we’d each parked there anyway and wouldn’t be hogging a needed space, we walked around a little. There’s a pretty good junk shop called Cool Stuff Weird Things next door, and a tiny little coffee shop called Headquarters next to it. Our son then enjoyed the playground while we continued chatting, and there’s a public library which we visited as well. Anybody coming to this neighborhood might also be tempted by one of the Hattie B’s locations or Bobbie’s Dairy Dip. The Great Escape comic and record shop also has a store here, and I continued my proud and extraordinary almost twenty-year tradition of always coming to Nashville the weekend before or the weekend after their sidewalk sale, which is why we didn’t stop: pique. We did stop at the Nashville McKay, found something I hadn’t found at the one in Chattanooga, and moseyed west. Dinner was a ways off, but it would be a very good one. Posted on March 14, 2018 by Grant G.Posted in burgers, hot dogs, nashville, tennesseeTagged burgers, hot dogs, nashville, slugburgers, tennessee.